This was an ugly week on the Presidential campaign trail. As a conservative it’s not my habit to call out a GOP candidate this early in an election, but this week one of the candidates was so vile it’s hard not to speak up. In case you missed it here is (click here) Trump calling for the total ban of all Muslims entering the United States. A total ban, you didn’t read that wrong. This is dangerous in its very nature. Don’t be fooled, Trump’s impulses are decisively authoritarian and are unfit for our system of government. Not to be too stark, but such remarks will be a tool for the recruitment of extremists. And consider this if he were ever elected would you imagine a President Trump, ever standing for impeachment? Wouldn’t he just shut Congress down, send in the troops? Imagine the chaos and degradation to our society with such a man in office. “‘Do you notice how tender they (the notion of freedom or say security) make the citizens’ soul, so that if someone proposes anything that smacks in any way of slavery, they are irritated and can’t stand it? And they end up, as you well know, by paying no attention to the laws, written or unwritten, in order that they may avoid having any master at all. ‘Of course, I know it,’ he said. Why does Plato recount this? Simply this, when there is strong discontent in the polis, the opposite of its ideals can take hold as a means for change. The very thing that is pronounced as the most important, becomes a tyranny when there is no restraint or bounds for this good. That is part of what we are seeing in the candidacies of the extreme with Trump and Sanders. In times like this, it rests with those who can still articulate a moral vision and cohesion for society to speak up and engage . As St. Paul says we are to be engaged. In the world but not of it. Engaged with the ideas but not reflecting the stale incarnation of bad ideas. Advent is a really interesting time liturgically for the church to consider the themes and realities of hope in the midst of discord and confusion. We are preparing for the coming of the King of Kings, but waiting like the people of God had to wait, in that expectation, that reality of pain and anguish and exile and separation, waiting for the coming of the Messiah. The Savior to be born, the incarnate one. Incarnate and suffering pain, much like many in the world today are and will. 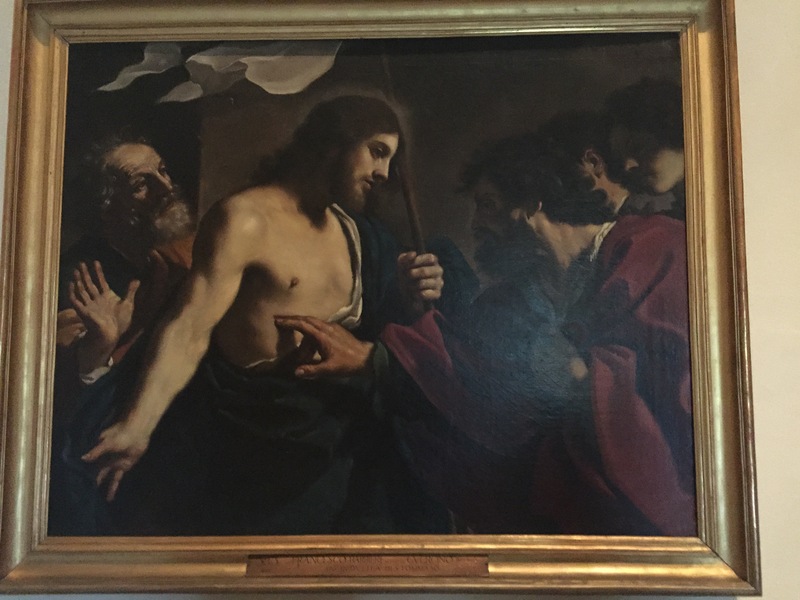 St. Thomas touches the Risen Lord with his visible wounds. Wounds that are still present but transformed. They are no longer wounds that lead to death but are embodied into new life and new creation. This is the sort of healing that is needed in the body of Christ. Healing the remembers the very real wounds from its own members, disfigurement caused by sin and anger, sins that mark the relations between churches (Catholic and Anglican or Presbyterian and Methodist) and between peoples (Russian and Ukrainian) but that must be made whole so that new life can be created. This is part of what we are hoping for and building on in this season of Advent.